Newton, MA, August 12, 2009 - Telerik, a leading vendor of development tools and user interface components for the Microsoft .NET Platform, announced the official release of the Visual Style Builder for RadControls for ASP.NET AJAX- a web-based, fully functional CSS customization tool that enables easy, point-and-click customization of skins. With this version the Visual Style Builder marks support for all controls from Telerik’s AJAX toolset, allowing for visual modification of any skin element. Introduced with Telerik’s Q2 release, the Visual Style Builder provides colorization mode for quick and easy change of the general skin color, as well as fine tune-mode for advanced skin customization. With the official version of the Visual Style Builder, all RadControls’ skins can be edited and adjusted in the fine-tune mode to fit in any web application. The tool’s intuitive graphical interface allows for easy edits of any skin detail - text fonts and sizes, margins and padding, background, any style property. Additionally, the new version brings numerous UI enhancements for much improved user experience. Telerik, a leading vendor of developer tools and user interface components for .NET, is excited to announce the Q3 2008 release of its RadControls UI components and Report designer. Telerik registers significant growth in its developer tools portfolio by adding an enterprise-grade ORM product and a rich suite of components for Silverlight, thus making it the widest product line on the market. Telerik is proud to present RadControls for Silverlight - the richest set of components for next-generation line-of-business applications. The great performance of the components is guaranteed by the smart use of data virtualization and Load on Demand mechanism, which results in significant performance gains. RadControls for Silverlight are fully stylable through Microsoft Expression Blend. Thanks to its full interoperability with ASP.NET AJAX, they can be used to enhance existing web applications. Another manifestation of Telerik’s urge to offer complete developer solutions is the newly-acquired ORM product OpenAccess – an enterprise-grade tool, used by companies in very demanding scenarios. Supporting both forward and reverse mapping, it offers transparent persistence for your DAL and business objects. Advanced techniques like multi-level caching and fetch plans deliver substantial performance optimizations. Q3 2008 release of RadControls for WPF concentrates on rich data visualization and interactivity by introducing powerful and completely stylable charting, gauge and scheduling controls. Through powerful rendering, rich data binding support and attractive animations the new additions to the suite take data visualization to another level. The ASP.NET AJAX suite further establishes its position as the most mature toolset for building rich web applications. One of the focal points is that RadControls for ASP.NET AJAX now can work in the new Microsoft ASP.NET MVC framework. Due to the integration with the newly-acquired OpenAccess ORM, important data access capabilities were delivered to all databound controls. The axis of the new release is the new RadScheduler control, which offers rich Outlook®-style functionality with swift performance, simplified deployment and limitless customization capabilities. Another essential addition to the Telerik WinForms suite is the ability to apply advanced Rich Text formatting to all products. Telerik Reporting delivers enhanced performance by introducing a completely new report rendering engine, which allows for speedy report generation, better allocation of server resources, and optimized report layout management. December, 19 2007, NEWTON, MA – Telerik, a leading vendor of UI components for .NET development, is excited to announce the release of RadControls Q3 2007. The latest volume includes updates for all product lines for web and desktop presentation layer development, as well as a new release of Telerik Reporting and a preview of Telerik’s RIA controls for Silverlight 1.1/2.0. To explore the “Prometheus” controls and experience the Telerik difference, please visit our online demos. While most of Telerik’s new development efforts have been focused on “Prometheus” the Q3 release also brings full Visual Studio 2008 support and several key improvements to the most widely used components in RadControls for ASP.NET – RadGrid and RadEditor. Several of the innovations made in Prometheus allowed our team to significantly improve the performance of RadGrid. The completely rewritten databinding core resulted in a tremendous performance gain. The Q3 2007 release also introduces official support for LinqData source. RadEditor’s content filters were improved and now the leading HTML editor for ASP.NET can output consistent XTHML-compliant content across all major browsers. The latest release continues Telerik’s pursuit to unify the aesthetic Vista-like presentation with the stability and familiarity of traditional Windows Forms technology in a comprehensive, well-integrated suite of WinForms UI components. RadStatusStrip, RadSpinEditor, RadDateTimePicker ,RadRadioButton), as well as Visual Studio 2008 support and major improvements in the Telerik Presentation Framework. The improvements in TPF have contributed for dramatic performance gains and deliver on Telerik’s promise to offer customers components that are both the best looking and best performing on the market. The latest release also introduces CAB support to aid the development of Enterprise-grade projects with RadControls for WinForms. Telerik’s Reporting Tool has also been enriched with great new capabilities for the Q3 release. The updated Reporting component features an Excel Rendering Extension, which allows exporting a report into a Microsoft Excel spreadsheet for offline verification, without the need for installing Microsoft Office. This new feature supports Microsoft Excel versions 1997-2007. In addition, Telerik Reporting now offers a unique way for providing dynamic table-like layouts by docking/anchoring report items. This new feature simplifies the development process, and further empowers users to efficiently create and style reports. Migration from other reporting solutions is further simplified by adding a converter from XtraReports®. 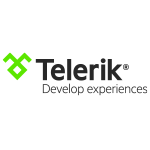 Several months ago Telerik was one of the early adopters of Silverlight and released the first commercial component library for v1.0. Diving deeper with the technology, Telerik started working on a rich set of must-have controls that will enable customers to build RIA applications on Microsoft’s emerging platform. On December 14th, 2007, the Telerik RadControls for Silverlight made their world premiere. See the recording of the presentation. An online preview of the newly demonstrated controls. While it was a challenge to build controls on an “alpha” platform, the final results clearly demonstrate that Silverlight can deliver a new type of user experience and that Telerik will be on the forefront of enabling customers to take advantage of Microsoft’s RIA technology. The price of the RadControls for .NET Subscription is $1299 per developer seat and includes all ASP.NET, ASP.NET AJAX (“Prometheus”) Windows Forms and Telerik Reporting component libraries, as well as complimentary licenses for Telerik’s upcoming Silverlight and WPF controls. The license comes with a Gold Support Package (up to 24h response time), full C# source code, redistribution rights and free updates for the latest products for one year. All the tools work without license keys and can be freely deployed on an unlimited number of development, testing and production servers. A step-by-step self-paced tutorial and hundreds of code samples are provided to accelerate your learning. Telerik is a leading vendor of development tools and components for Microsoft .NET. Developers from most of the Fortune 2000 companies, many of the world’s leading educational and non-profit organizations, and thousands of consultants rely on Telerik products to build applications with unparalleled richness, responsiveness and interactivity.